Just when I thought that the mobile market in the Philippines is already saturated, both Samsung and Vivo Mobile announced new midrange Android smartphones that immediately captured the fancy of many Filipinos, prompting them to think about upgrading from their current entry-level or aging mid-level handset. 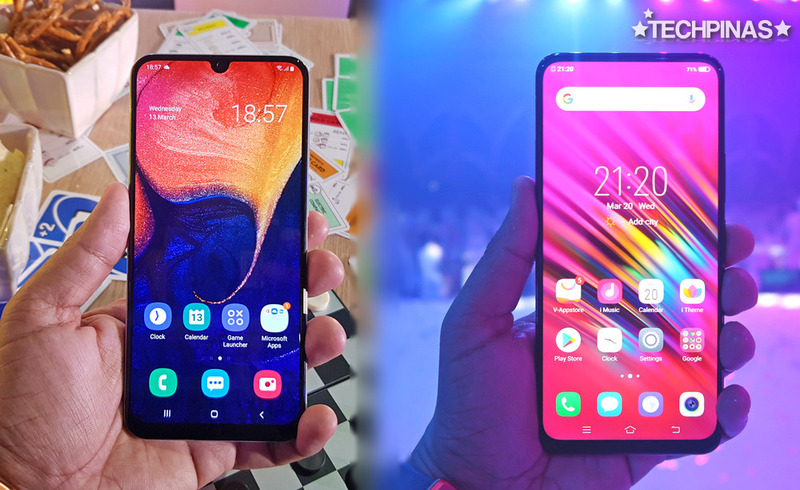 Over the past three days, I've been receiving a ton of inquiries from my readers who are having a hard time choosing between the Samsung Galaxy A50 and Vivo V15 -- and understandably so. Both devices have a price tag of around PHP 18,000 and they come with comparable selling points. One of my readers asked me, "Sir Mark, coming from my midrange smartphone from 2016, which model between those who would give me more value for my money?" To answer her question as well as the many other inquiries that I got about these two hotshot Android phones, I've decided to make this comparison post. Thankfully, both Samsung and Vivo Mobile had invited to grace the formal Philippine launch of these two devices earlier this month. Hence, I have seen them in the flesh and I've even got the chance to play with them and to take their photos and videos. That said, I'm going to compare them based solely on my initial impressions as well as what's on their individual specs sheet. Let's start with the design comparison. As you can see in the photos above, Samsung Galaxy A50 and Vivo V15 have more or less the same rectangle with rounded sides footprint, all-glass-face, and high-gloss, curved plastic back plate. The designs of their FullHD+ screens with 19.5:9 aspect ratio and rounded corners are also comparable. However, the one on the Galaxy A50 has a notch while the Ultra FullView display of the Vivo V15 does not have that polarizing element. Needless to say, many consumers hate the notch because - as they say - it takes away from the viewing experience instead of enhancing it. To be fair, some have accepted it as a novelty feature. Vivo was able to skip the use of the notch by incorporating a motorized elevating front-facing camera on the V15, which we first saw on the Vivo NEX and Apex. This is one of the distinguishing design characteristics of the Vivo V15. Looking at the back panel, Samsung Galaxy A50 comes in solid White, Black, and Blue color options. Vivo V15, on the other hand, is available in Topaz Blue and Glamour Red, both having an iridescent, gradient finish that for me, looks more visually attractive. But hey, if you like a more plain look, the Galaxy A50 should be more appealing to you. Which one looks better? I guess it all depends on the user's personal preference or taste. The two phones feature a Triple Rear Camera set-up, made up of a primary cam with enhanced low light capability, a secondary cam with wide-angle lens, and a tertiary depth sensor for cleaner looking bokeh effect. In both phones, the three optics are lined neatly in a column placed in the upper left corner of the back plate. The module housing all the rear cams of the Galaxy A5 has a simple design similar to that of the Samsung Galaxy A7 from 2018 while the one on Vivo V15, which is another identifying design element, looks exactly the same as what's on the Vivo V15 Pro. As you can see in the photo above, the Galaxy A50 lacks a rear-mounted fingerprint scanner, which is present on the Vivo V15. This is because the Samsung smartphone features an in-display fingerprint sensor, which is quite a treat in this price point. Alright! I think we're ready to jump to the technical specifications comparison. For that, I made this meticulous table to make it easier for us to do the shoot-out. Let's do this per specification or detail. Dimensions - Samsung Galaxy A50 is slightly smaller and thinner than the Vivo V15. Weight - Vivo V15 is heavier than the A50 by 20 grams. Some people prefer lighter phones and some users like handsets with reassuring heft. Display - Both phones have a 19.5:9 display with FullHD+ 1080 x 2340 pixels resolution and rounded corners. However, the one on Galaxy A50 is SuperAMOLED, which is supposedly more brilliant than the IPS screen of the Vivo V15. What Vivo V15 has going for it in this department, though is that its display is slightly bigger at 6.53-inch versus 6.4-inch on the Galaxy A50. Also the V15, as I've said, doesn't have a notch. So if you hate that feature, know that you don't have to stand it. Front-Facing Camera - Vivo V15 has a higher resolution front cam at 32 MegaPixels f/2.0 while the Samsung Galaxy A50 has a 25 MegaPixel f/2.0 front snapper. Both cameras are powered by the companies' own AI beautification software that evens out your skin tone while retaining the identifying marks and characteristics of your face. The Vivo V15 has a motorized, elevating selfie shooter, which enabled the Ultra FullView display. Some consumers are concerned about the durability of this element but trust that all Vivo smartphones must pass strict quality standards and stress tests before released to the market. Triple Rear Camera Module - As I've stated above, the two handsets share practically the same features for each shooter. However, the primary camera on Samsung has a higher resolution has wider aperture supposedly for better low light performance. Anyway, I think we need to do a more thorough comparison of these optics through a separate camera shoot-out post or video. In this case, we'll only know which cameraphone is better through actual photos. Stay tuned for that! Oh, and as a side note, Samsung and Vivo Mobile had put intelligent imaging features on these handsets. Vivo calls it AI technology while Samsung version is named Scene Optimizer. Basically, the primary camera automatically tries to figure out what's in front of the lens and the software adjusts the colors, highlights, and shadows (among other elements of photography) to deliver the best shot possible. Some of the subjects that these two cameraphones can identify include Greenery, Food, Person, Sky, Pets, Sunrise, and Sunset. Video Recorder - Vivo V15 has the clear advantage here because its primary rear cam can shoot 4K 30fps while the one on Galaxy A50 can only do FullHD 1080p 30fps. What's good about both models though is that their front cam can shooter FullHD 1080p 30fps, which is great for vloggers or budding Youtube content creators who want to see themselves while recording videos of their daily activities. User Interface and Operating System - Both devices run on the new Android 9.0 Pie operating system and comes with all of the features that go with this version of Google's mobile OS. However, the Galaxy A50 features Samsung's updated One UI while Vivo V15 has the Chinese company's FunTouch OS 9 skin for Android. Which interface is better? Again, it all depends on the user's preference. However, both UIs are pretty much already familiar to many consumers and are made for easy navigation. One key difference between these two skins, though, is that FunTouch OS lacks an app drawer, which has always been present on Samsung's interface -- even on earlier versions. Processor Benchmarks - Samsung Galaxy A50 runs on the 10nm Exynos 9610 Octa chip while Vivo V15 is powered by the 12nm Octa Core MediaTek Helio P70 processor. Geekbench Test results show that Exynos 9610 Octa has better single core performance (~ 1615 vs 1560) while Helio P70 tend to get higher multi-core scores (~ 5988 vs 4380). One thing I want to note, however, is that Exynos 9610 has a 10nm architecture, which supposedly makes it consume less power than the already energy-efficient 12nm processor by MediaTek. Graphics Chip - The two smartphones have the same Mali-G72 MP3 GPU, which is powerful enough to deliver a buttery smooth gaming experience when running popular titles like Mobile Legends: Bang Bang and PUBG Mobile. RAM and ROM - Vivo V15 and Samsung Galaxy A50 are pretty much even these departments as they both have 6GB of RAM for multitasking and a sizable 128GB of expandable storage. Fingerprint Scanner - Both phones have this feature but the one on Vivo V15 is mounted at the back while the one on the Galaxy A50 is integrated into the screen. As I've said, at this point, an In-Display Fingerprint Scanner is a real treat on a midrange Android smartphone. This feature lets you unlock the handset without having to pick it up if it's on the table or more quickly using your thumb when you're holding it. It's really good when it works flawlessly -- and that said, we still have to check just how fast and accurate the Galaxy A50's on-screen fingerprint scanner is. Battery and Fast Charging - Samsung Galaxy A50 and Vivo V15 are both powered by a large, non-removable 4,000 mAh Li-Po battery pack. The two phones come with Fast Charging technology; 15W for Samsung and Dual Engine technology for Vivo's midrange. Test results show that it takes 1 hour and 50 minutes to fully charge the Galaxy A50 from 0%. 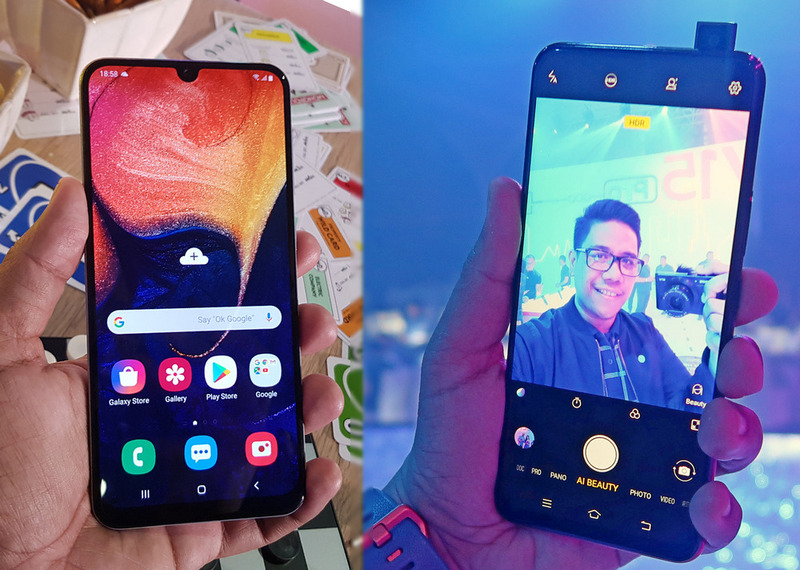 So which 2019 PHP 18,000 Midrange Android Smartphone is right for you? 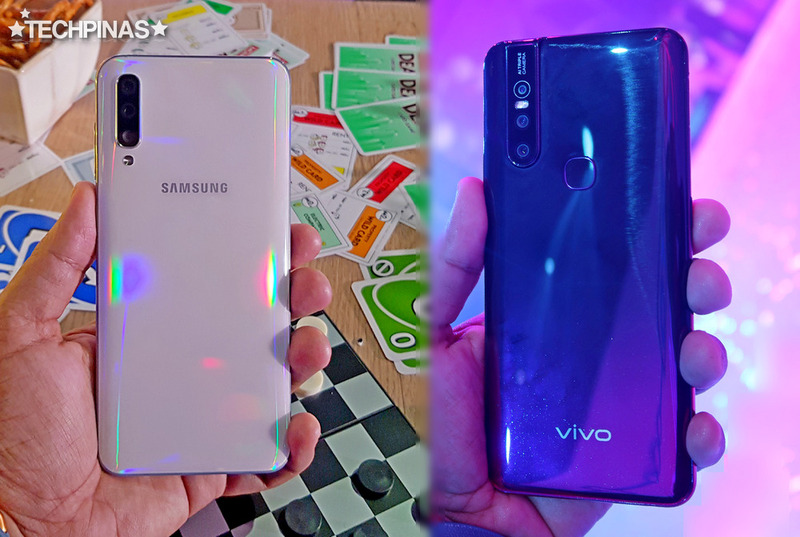 Vivo V15 or Samsung Galaxy A50? Actually, I don't think you can go wrong choosing any one of these two. In the end, though, in all depends on which brand you trust more, which features are more important to you, or which qualities of a handset you can't stand. For instance, if you hate the notch or if you don't like an elevating camera, then the choice will be easier. It's all about weighing your options and making the right compromises. Personally, though, if I'm just considering the screen, the design, and video recording capabilities, I'd go for the Vivo V15. But that's just me. I'm sure there are consumers who will prefer the more simple look of the Samsung Galaxy A50 as well as its supposedly more energy-efficient processor. I think it's a virtual tie -- so just take your pick and know that it has my approval.